This is a useful guide to taking photos while on a safari. Read tips on how to take the best wildlife photos. One of the best pieces of advice you can be given is that you need to really know how your camera functions. For instance which is the anti-motion, or motion button? Does it have a landscape function? What sort of zoom range does it have? How do you set it on manual and change the aperture and shutter speed? If you plan to buy new camera equipment before this trip, make sure you are completely familiar with its operation. Try to envisage the type of lighting and subject conditions you will experience on the trip, and experiment at home in the garden and with the cat or dog to learn how your camera works and perfect your technique. A trip to the zoo may help you with identification and technique. Look for a camera with a quiet shutter sound, as you do not need loud clacking sounds every time you take a picture, as this will scare off the subject of your photo. Time spent in preparation will pay dividends in the field. For those of you who are real camera buffs, it is a good idea to bring along a small automatic (point and shoot) camera for convenience, in addition to your bulky SLR cameras. This will be very useful as a backup camera and in situations where setting up an SLR is too time consuming and absorbing. Be patient and take lots of shots. Many professional photographers take hundreds of photos to get that one perfect shot, so do not expect to get it on your first try. It's important to know the behaviour of the animals you're trying to photograph. By understanding their behaviour you will have a better chance of finding them and you will be able to predict their actions. By reading up on animal behaviour you will learn the different kinds of terrain the various animals prefer. You can combine that knowledge with that of your qualified guide to plan the best African game drives and bush walks, where you will have the opportunity to take some amazing photo's. Remember the basics such as the rule of thirds when it comes to framing and placing your subject in the picture. That said this can be corrected with photo editing equipment. The best time to take photos is in the early morning and late afternoon; this is when the natural light is best for taking photos, and when the animals are most active. This is also the time of day when most game drives take place. Make sure that you don't put yourself in danger. Never interfere with the natural behaviour of the animals in order to take a better photo. If you are on a game drive, do not get out of a vehicle to take a photo - animals are scared off by humans as they have been hunted for thousands of years. You are more likely to get a shot if you stay in your vehicle as in many safari areas the animals have become used to the presence of vehicles. Do not let your camera blind you. There is a whole world out there and pictures only capture the images. The sights and sounds of these undeveloped areas are all interwoven, and if you spend an inordinate amount of time peeking through the viewfinder you will miss most of the trip. Be ready with your camera at all times though as animals do not keep appointments - kills happen in a flurry of fur and snarls; and leopards leap from trees in a split second. When taking close-up or portrait pictures focus on the animal's eyes as this creates an engaging photo. This guarantees that most of the animal's face will be in focus. Be prepared and ready with your camera at all times, as animals may suddenly appear and disappear just as quickly. You can also draw the focus onto your subject by throwing out the background and making it blurry. This can be done by setting your camera on manual and using a wider aperture which will bring the focus in on the animal. Take a range of photos of your subject. For example, when taking photos of an Elephant, take a portrait shot; include one more with the general habitat in context to the subject, then another with close-up detail, such as horns and face. Photos are more interesting if you capture some context, look at what is in the foreground and background that is going to enhance or detract from your photograph. Do not centre all your shots; leave room in your subject for the animal to move into. This will prevent lifeless composition and give an imitate portrayal of your subject. Use the rule of thirds when composing your picture. Have your camera out and set to the best settings for that particular time of day and conditions or else you could just have it set on automatic. Most safari vehicles are very stable; however with 5 to 7 people in them each person's movement can affect someone's ability to take the perfect picture. It is a good idea to ask everyone to be still for just a moment, while you shoot, and thank them afterwards. Please remember not to monopolise the best spot for photos and to be considerate of your fellow trip members' needs and wishes. Your trip leader will help organise seat rotations within the vehicle. Some part of all trips will involve meeting people from local tribes and with cultural backgrounds different from your own. Please be courteous when taking pictures. It is always a good idea to build rapport with your subjects first and then ask them if it is OK to take their picture. In some cultures it is taboo to have your photo taken and it is very obtrusive to just take peoples photos, so always ask their permission. Any good digital camera will do to get shots of wildlife, but to get really good shots you should probably invest in a 35mm SLR camera. Your camera should shoot at least 5x a second so that you can capture the animals in motion. A good starting point for wildlife photography is a lens with a 300mm in focal length. Bird photography will require a camera that has a 500mm lens. Many cameras have good automatic functions these days, but learning how to adjust your camera settings manually is also a good idea. When the subject is in motion, use a shutter speed of at least 1/125, except if you are using a panning method. Some photographers recommend the Nikon SLR cameras as they offer you good low light capabilities. Most SLR's come with a standard lens. Most of these are good for everyday use. For wildlife photography you might want to invest in a lens with an f stop of 4 through to f 2.8 or a 100-400 f5.6.There is no need to buy really huge tele-photo lenses as they are cumbersome and get in the way of your safari experience. A standard 50mm and a wide angle lens is good for scenery and people shots. If you are an avid photographer you may want to bring two SLR camera bodies (of the same type) so you will not have to constantly change lenses. You need to bear in mind though that this is extra weight when flying and that with two cameras you will spend more time fumbling in your camera bag, getting dust in your one camera body, and missing the action! Skylight and haze filters are useful for lens protection as well as picture enhancement. Polarizing filters are useful when taking pictures over water and with wide-angle shots with sky and clouds. Tripods are cumbersome and you will have few opportunities to use them, but if they are light-weight you may want to bring them along, especially if you are planning on waiting awhile for the perfect shot - the more stable your camera is, the better. Bring plenty of spare batteries for your camera. If your camera battery comes with a charger, bring it as many lodges will have charging points. If you are relying on disposable batteries, please note that they will be hard to find in Africa, and you should bring extra. It is very handy if all your equipment uses the same size batteries, so that if you run short, you can borrow batteries from your other equipment. Camera phones and Ipads generally do not have the zoom required to take a decent wildlife shot. However many people travel with their phones, Notepads, Mapbooks and Laptops. You can download your photos onto them and upload your photos onto a sharing network when you find Wi-Fi facilities. Alternately you can put them on a flash drive, thereby freeing up space on your memory card. There are also several apps that allow you to enhance your photos such as Hipstamatic and Instagram among others which help you create effects usually only achievable with high end lenses. Many people from Western countries are used to taking photos and sharing them instantly on social networks and sharing sites through their phones. There is limited coverage in Africa and you will not always be able to do this. If you are staying at a lodge or camp that has wifi facilities, it is recommended to upload your digital images to the cloud for safety. In the unlikely event that your camera, phone or memory cards are stolen or misplaced, by uploading your digital photos to the cloud (iCloud, Sync, Dropbox etc), you will never lose the precious memories of your African safari. The transportation used in these trips is quite rugged, vibration from engines and corrugated roads can play havoc with your camera gear so pack it well in a good well padded camera bag. Always take your camera equipment as hand luggage and keep an eye on it; this is the best way to prevent theft. Also, on photography safari's it is not uncommon to drop cameras in or out of the vehicle. On some trips you will be on board boats and there is the chance that you and your gear may take a swim. It is therefore important that you insure your equipment. A home owner's policy will usually cover camera gear. A video of your wildlife safari is a wonderful memento. With today's technology many cell phones and cameras can take video. Remember however if you are using your camera that video takes up a lot of space and you will need a large memory card. You might also want to bring along a small video recorder. Please remember a charger. Many lodges have electricity and charging facilities, but it is a good idea to bring spare batteries. To make the most of your videos - shoot some practice film before your trip. Frequent mistakes when shooting video footage are zooming in and out too quickly, holding the camera unsteadily, and swinging the camera around in a fast traverse, all of which can lead to sea-sickness amongst your living-room audience. Rather stand steadily and rest your camera on the vehicle for support. You will find that the slightest noises will be picked up on your video microphone: motor drives, comments, whispers etc. You might want to bring a clip on microphone so that your own voice or that of your on the spot commentator can be heard above the background roars, clicks, zips and conversation. Binoculars are strongly recommended for every trip member. They are invaluable for observing larger animals as well as birds. A 7 or 8 power binocular works well for most people, but if you are particularly interested in birds a 10 power is best. We recommend that each trip participant bring his or her own pair, as it is most frustrating to strain for the sight of a brightly coloured bird high in the tree, while waiting to borrow a pair of 'Binos', only to have the bird fly away once you finally get the binos. Well these are just a few pointers, and remember the more you learn about the quirks of your particular camera, the better pictures you'll take. One of the advantages with digital and modern technologies, many photographs can be enhanced with photo editing software! Take lots of photos and you're sure to have some that are really good. Happy snapping! The 4x4 safari vehicles enable the rangers to leave the road and provide guests with close up game viewing and fantastic photographic opportunities. Night drives, with the aid of powerful spotlights, bring the bush to life. 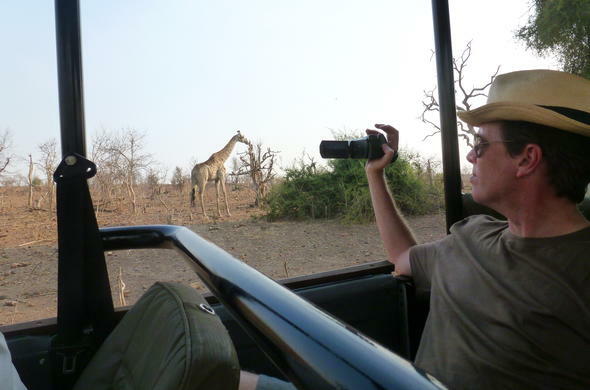 You will have the opportunity to view and photograph wildlife on game drives. There will be ample space for your photographic and binocular equipment.